Zaguán and Alento, directed by Antonio Najarro, has earned the Ballet Nacional de España one of its greatest triumphs. The special magic of amenco joins hands with up-to-dateness in this exceptional show, which is based on tradition but bears recent innovations in mind. Theatres in Spain, France and Japan have enthusiastically acclaimed the blend of amenco, tango and jazz offered by the BNE with results that are fascinating to both eye and ear. The title the company has chosen to mark its return to the Liceu, after the success of Sorolla in 2015, combines loyalty to tradition with exciting ventures along new paths. Barcelona's opera house, the Gran Teatre del Liceu, was founded on the Rambla in 1847 and has continued over the years to fulfil its role as a culture and arts centre and one of the symbols of the city. Today it is publicly-owned (by the Government of Catalonia, Barcelona City Council, Barcelona Provincial Council and the Ministerio de Educación, Cultura y Deporte) and administered by the Fundació del Gran Teatre del Liceu which, in addition to the aforementioned bodies, incorporates the Patronage Council and the Societat del Gran Teatre del Liceu (the old society of owners). The Liceu evolved out of the Sociedad Dramática de Aficionados (Society of theatre-lovers) set up in 1837 at the instigation of Manuel Gibert in the former convent of Montsió by members of the National Militia, an organization of armed citizens with liberal leanings. Barcelona's economy and population were growing fast at the time and the city needed a music conservatory. This led to the conversion of the Sociedad Dramática into the Liceo Filármonico Dramático Barcelonés de S.M. la Reina Isabel II (Barcelona Dramatic and Philharmonic Lyceum of HM Queen Isabel II). In addition to its theatrical activities, the new organization cultivated Italian-style singing and music. The original building was solemnly opened on 4 April 1847. The plans had been drawn up by Miquel Garriga i Roca, subsequently assisted by Josep Oriol Mestres. 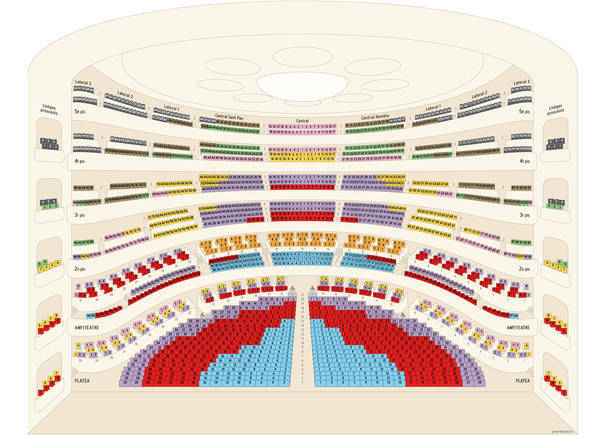 The project was funded by selling shares, which meant that many of the boxes and seats were to be privately owned. The shareholders formed the Societat del Gran Teatre del Liceu, known as the “Societat de Propietaris” (Society of Owners), which was in sole charge of running the Gran Teatre del Liceu from 1855 onwards, after it was legally separated from the Conservatori del Gran Teatre del Liceu. The theatre was operated by impresarios who were given a concession to stage a specific number of productions in exchange for the proceeds from the sale of tickets not reserved for the Societat itself. This system was to endure until 1980. By the last quarter of the 20th century this management system was no longer viable. 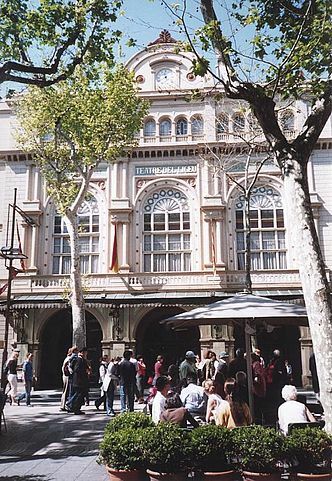 In 1980, to avert the danger of the disappearance of an institution of such worldwide cultural renown, the Generalitat  Catalonia's first government in modern times – set up a consortium, the Consorci del Gran Teatre del Liceu, which also incorporated Barcelona City Council and the Societat del Gran Teatre del Liceu. Barcelona Provincial Council joined the Consortium in 1985, followed by the Spanish Ministry of Culture in 1986. From then on the Consortium took over operation of the theatre.